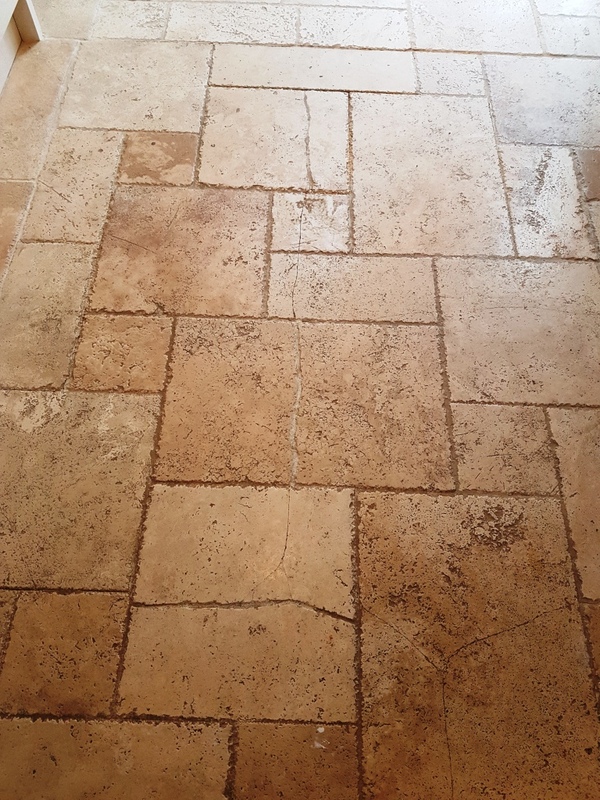 You can’t beat the natural beauty of a stone floor, but you will find that over time the protective sealer wears down and dirt becomes ingrained in the pores of the stone. This process is so gradual you might not notice it until one day your looking at old photographs and realise the difference. 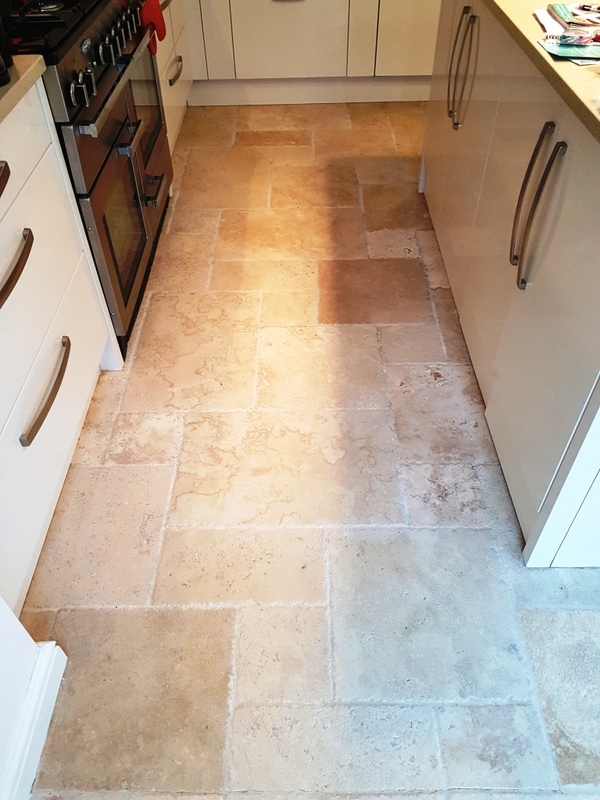 On this occasion a customer of mine had a Limestone tiled floor installed in the Kitchen of her house in Chesterfield fifteen years prior. 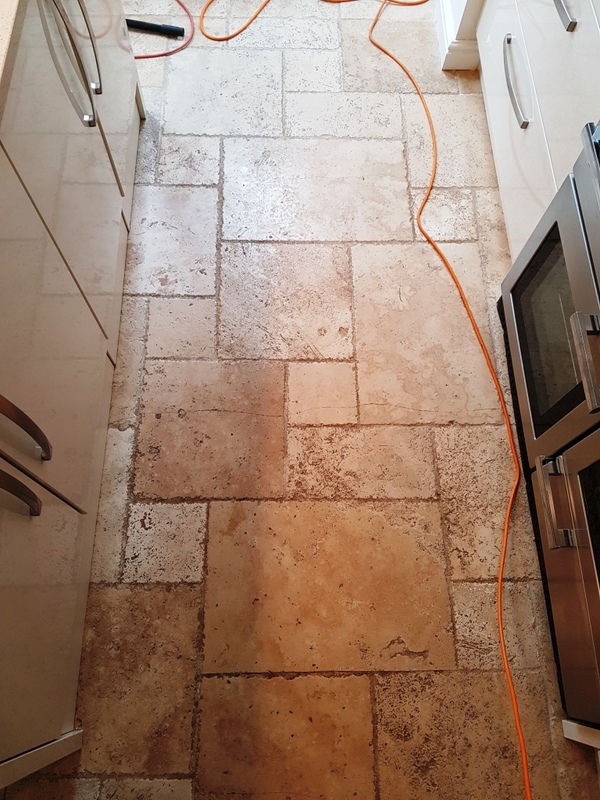 It had never been deep cleaned and resealed since being installed and having recently completed a house extension with a new Limestone floor she realised just how dirty and tired the original floor now looked. I went over to take a look at the floor, demonstrate the cleaning process and discuss the different sealers we have available. She has happy for me to do the work and specified she didn’t want the floor to have a gloss appearance, so a matt sealer would be best. I returned a few weeks later to carry out the work and started by adding protection to the Kitchen units. The Limestone has quite ingrained and had quite a few scratches in the stone that would need to be grinded out so fitted a very coarse 100 grit diamond encrusted burnishing pad fitted to my heavy rotary floor buffer. You apply water to help lubricate the process and then once finished the floor is rinsed with more water and the soil extracted with a wet vacuum. 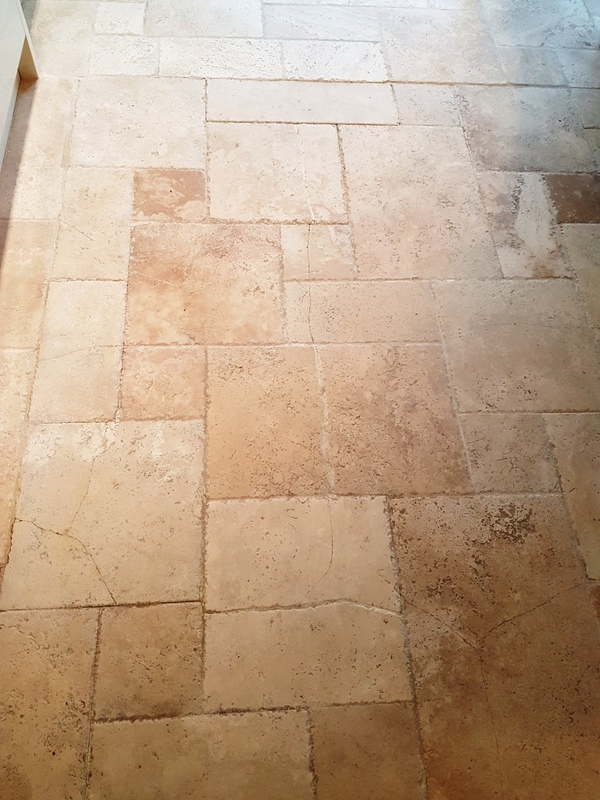 The next step was to get the grout as clean as possible by applying a strong dilution of Tile Doctor Pro-Clean and then scrubbing it by hand with a stiff narrow brush. This action released the dirt from the grout and was rinsed away again with water extracted using the wet vacuum. 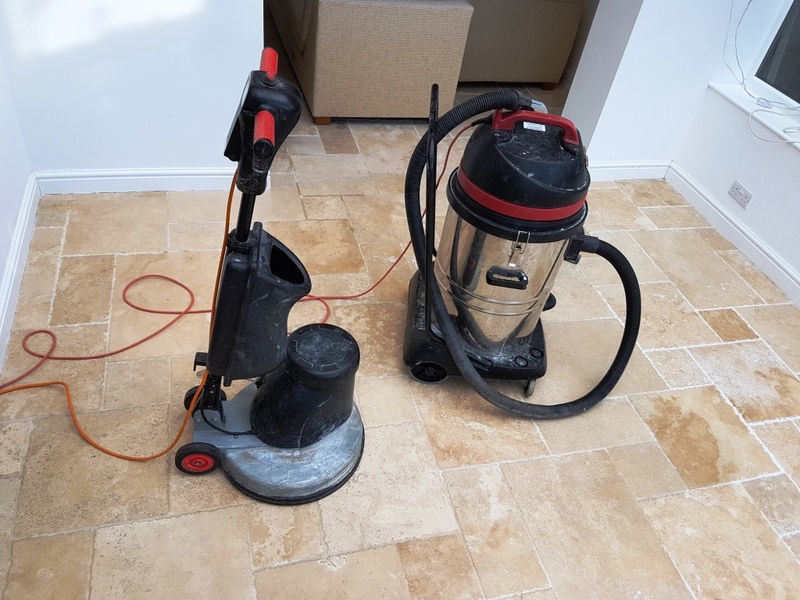 This burnishing process was then repeated using a 200 grit and then 400 grit burnishing pads to refine the finish of the stone and close the pores, again water was used to rinse off the soil and the vet vacuum used to get the floor as dry as possible. Whilst drying the floor with the wet vacuum I also inspected the floor and identified areas for further spot treatment. I also noticed a few places where the grout had crumbled and needed replacing and so this was raked out and re-grouted with a beige grout. The next morning, I returned to the property to finish off the floor with the matt sealer we had discussed earlier. The floor must be dry before applying the sealer, so I took a few readings with a damp meter first to ensure that was the case. This is important as it’s not unusual for sealers to go milky or ever peel off later if the floor hasn’t been thoroughly cleaned or wasn’t dry when the sealer was applied. All was well, so I started applying the sealer which in this case was Tile Doctor Ultra Seal, it’s a matt sealer that protects the stone from within by impregnating the pores with sealant without altering its appearance. My customer was very happy with the result and now has two matching Limestone tiled floors, she also left the following short comment on the Tile Doctor feedback system.